Right, you're all up to date! Thanks for keeping me company this morning - until next time. Our time together is almost over, so let's lift your spirits and end on a positive note. The race for the Premier League took another twist, a referee was at the centre of a key incident almost too bizarre to explain in a crucial relegation clash, and a team scored with basically every attack for about 10 minutes. The theme of Saturday's EFL action was goals - keeping them out, not scoring them, breaking a record, going goal-crazy and scoring a pretty crazy goal. 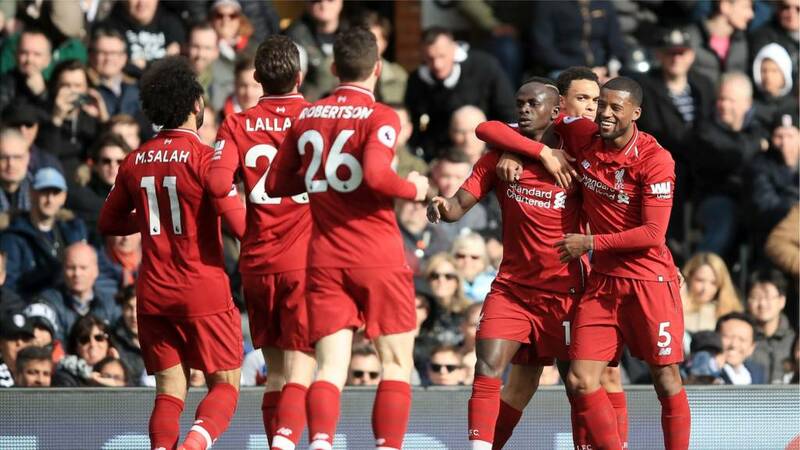 The Premier League, English Football League and Football Association have been accused of "double standards" for not holding tributes for 50 people killed in New Zealand's mosque attacks. Six Nations and rugby league games held silences at the weekend but English top flight and FA Cup games did not. Premier League clubs wore black bands and France's national anthem was played after November 2015's Paris attacks. Yunus Lunat, former FA race equality board chair, called it "hypocrisy". Read more of Shamoon Hafez's article here. Imagine the feeling of scoring in front of 60,000 fans in the Champions League. That's exactly what England's Toni Duggan did on Sunday night, as a record crowd watched Barcelona Women beat Atletico Madrid 2-0 at the Wanda Metropolitano. The attendance was a record for a top-flight domestic women's game in Europe. The day we've all been waiting for arrived on Saturday - Three-O Walcott Day. Check out this and more in BBC Three's top football tweets. Best goal has to be Terry McDermott v Spurs in 7-0 win I think 1978. Perfection. Mario Gotze's goal against Argentina in the world cup final - the improvisation in that moment to get the ball in the net was just the best thing I've ever seen! Leicester City midfielder James Maddison paid a touching tribute to his friend and supporter Sophie Taylor, five, from Norwich, who died early in January a year after being diagnosed with bone cancer. Maddison, who met Sophie when he played for Norwich City, scored from a free-kick in Saturday's 2-1 win at Burnley. The 22-year-old revealed he was wearing a top saying "RIP Sophie I Love You", but was shown a yellow card. Fans criticised the booking on social media, with one saying the officials "should have shown a little compassion". However, the Leicester player defended match referee Michael Oliver's decision, saying: "Regarding tweets about Michael Oliver, he's just doing his job and didn't have a choice. "He didn't enjoy showing me a yellow and shared his condolences about the passing of Sophie which I thought was very respectful." "Tests carried out on Monday morning have confirmed that first team player Luis Suarez has a sprained right ankle," the La Liga champions said in a statement on their website. "He will be out for 10-15 days and now undertake his recovery with the FC Barcelona medical team, having been withdrawn from the Uruguayan national team squad." "The FA are making a total mockery of the FA Cup". Garth Crooks hasn't held back in his latest team of the week. So, who features in this week's line-up? Head here to find out. Always had a shocking left foot but in last second against arch rivals, ball headed out and I acrobatically volley it into top left corner- once in a lifetime. Best goal? Could be my first goal of the season, went all game with out a sniff towards goal, chased an horrendous back pass to slot it in under the keeper.. reducing the scoreline from 12-0 to 12-1. More on the news that Juventus forward Cristiano Ronaldo has been charged with improper conduct by Uefa for his celebration after beating Atletico Madrid to reach the quarter-finals of the Champions League. Juventus have been drawn to drawn to play Dutch side Ajax in the quarter-finals. Ole Gunnar Solskjaer described the defeat by Wolves as "big step backwards". "This was the poorest we've played," Solskjaer told BBC Sport. "We started too slowly and played into their hands. Our possession wasn't bright enough and quick enough, so it's disappointing." Then why not create your perfect player?! Head to BBC Football's Instagram story, reply with your four suggestions to the below photo and you could feature in their story too! Nuno Espirito Santo's side, in their first quarter-final since 2003, stunned Ole Gunnar Solskjaer's side on Saturday with goals from Raul Jimenez and Diogo Jota. Read Phil McNulty's match report here, and watch the highlights below. White Hart Lane railway station is set to be renamed Tottenham Hotspur, subject to a public consultation, according to The Guardian. Rachel Armitage: Best goal I’ve ever seen has to be Neves vs Derby last season. Absolutely indescribable talent and he’s only 22! Nelly: Eifion Williams for Hartlepool against Darlington (at their place) on my birthday, 25/03/2007. Long ball upfield, 1 touch to control (Bergkamp stylee), 2nd touch volley over the keeper from 25 yards. YouTube it. You won't be disappointed.